Chemotherapy-induced peripheral neuropathy (CIPN) is a common dose-limiting toxicity of paclitaxel. At present, dose modification remains the most successful approach for the management of CIPN, and pharmacological treatment is limited to alleviating symptoms such as paresthesias, dysesthesia, and pain . To date, none of the potential neuroprotective agents tested in clinical trials have proven effective . The mechanisms of neurotoxicity in paclitaxel-induced peripheral neuropathy (PN) have not been fully elucidated; however, disruption of microtubule dynamics has been identified. Taxanes binding to β-tubulin components of microtubule assemblies lead to microtubule stabilization, thereby causing a disruption of microtubule dynamics . It has also been observed that paclitaxel administration produces abnormalities in axonal mitochondria . Additional targets of neurotoxicity include direct axonal toxicity at the distal nerve terminals . Patients with pre-existing conditions that are capable of inducing PN (such as diabetes, Charcot–Marie–Tooth, or kidney disease) are particularly predisposed to developing CIPN . Given the dose-dependent pathophysiology of paclitaxel-induced PN, we proposed a novel strategy for prevention of paclitaxel-induced PN by employing continuous-flow limb hypothermia to reduce delivery of the toxic chemotherapeutic agents to the peripheral nerves. Our previous in vivo study showed that a drop in rat sciatic nerve temperature from 30 to 20°C produced a fivefold reduction of nerve blood flow . Furthermore, in studies of chemotherapy-induced alopecia (CIA), which is a result of toxic accumulation of chemotherapeutics in the hair follicle, there is compelling evidence that cooling of the scalp protects against the development of CIA . The rationale behind using hypothermia in the prevention of CIA is that scalp cooling decreases the blood supply to the hair follicles, and hence, hair follicle protection is a result of reduced delivery of toxic chemotherapeutics . However, scalp cooling employing traditional cooling methods such as ice packs is poorly tolerated, which limits efficacy of the treatment itself . Hence, we employed a better-tolerated and efficient cooling technique of continuous-flow hypothermia. 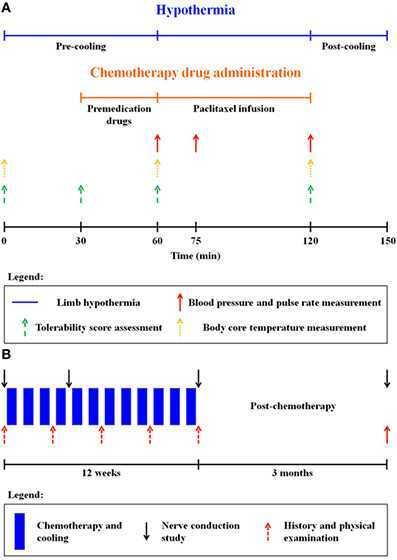 In a previous study in healthy subjects, we also established that continuous-flow limb hypothermia at a coolant temperature of 22°C was the lowest tolerable temperature for a duration of 3 h, matching the duration of paclitaxel infusion in cancer patients . Safety and tolerance of limb hypothermia were measured using three validated scales: visual analog pain scale (VAS), subjective tolerance scale, and the Shivering Assessment Scale (Figure S1 and Tables S3 and S4 in Supplementary Material) . Skin surface temperature was continuously recorded throughout limb hypothermia via temperature sensors (accurate to ±0.1°C) placed at seven locations on both the legs (Figure 2B) . Body core temperature was measured over the frontal non-glabrous scalp (Figure 1A). Assessment for neuropathy was performed using nerve conduction studies (NCSs) and clinical examination. NCSs are the most sensitive and specific detection method for neuropathies and superior to clinical examination or scores . Primary endpoint was differences in NCSs carried out at baseline (NCSbaseline), 1 month into treatment (NCSmid), the end of treatment (NCSend), and 3 months post-treatment (NCS3m) (Figure 1B). Sensory nerve action potential (SNAP) amplitudes and conduction velocities were measured in the bilateral sural, superficial peroneal, saphenous, and medial and lateral plantar nerves . Compound motor action potential (cMAP) amplitudes and motor nerve conduction velocities were evaluated in the bilateral common peroneal and tibial nerves . At the same time points, clinical evaluation using the validated Total Neuropathy Score (TNS) was performed .